(Nanowerk News) Surrounding the sun is a vast atmosphere of solar particles, through which magnetic fields swarm, solar flares erupt, and gigantic columns of material rise, fall and jostle each other around. 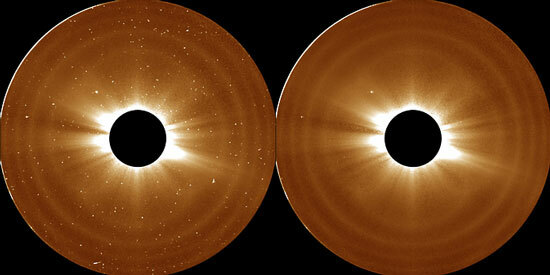 Now, using NASA's Solar Terrestrial Relations Observatory, scientists have found that this atmosphere, called the corona, is even larger than thought, extending out some 5 million miles above the sun's surface -- the equivalent of 12 solar radii. This information has implications for NASA's upcoming Solar Probe Plus mission, due to launch in 2018 and go closer to the sun than any man-made technology ever has before.